This month, the Conservation Column is all about the Greater Sage Grouse, one of America’s most iconic birds. The species, famous for its spectacular mating displays, is emblematic of the “sagebrush sea” in the inter-mountain West. Sage grouse populations have experienced sharp declines due to habitat loss and disturbance, particularly by energy development. In 2015, after an exhaustive consultative process, the Obama Administration unveiled a comprehensive conservation plan, designed to prevent the species from being listed under the Endangered Species Act. This month, the Trump Administration tossed out that plan, exposing the sage grouse to potentially catastrophic declines. Meanwhile, in Oregon, the Oregon Department of Fish and Wildlife (ODFW) has proposed a plan to poison as many as 1,500 ravens in order to reduce predation on Greater Sage Grouse nests. Ugh. But if you keep reading, I promise a bit of good news at the end. The Trump administration on March 15 lifted restrictions aimed at protecting Greater Sage Grouse across seven Western states. In Oregon grazing restrictions are being removed in 13 locations that provide habitat for the imperiled birds. The amended plans will affect sage grouse habitat on land owned by the Bureau of Land Management, including Oregon, Colorado, Idaho, Utah, Wyoming, Nevada and Northeastern California. In Oregon, the updated plans will remove grazing restrictions on small areas of BLM land that had been set aside for research purposes. Scientists had hoped to study what happened to habitat when cattle aren’t around. Ranchers said responsible grazing is good for sage grouse habitat. They said there are other areas in Oregon where there hasn’t been any grazing, and sage grouse numbers there are similar to grazed areas. So these small “research natural areas” aren’t needed. Ranchers have also argued that restricting grazing can be a “hardship” for people who use those areas as forage for cattle. The birds need large swaths of land for their flamboyant mating rituals, to raise their young and to overwinter. Their health is said to indicate the health of the entire sagebrush ecosystem and the 350 other species that live there, including mule deer, burrowing owls and pronghorn. But they faced backlash from some state governors, industry, ranching and conservation groups. In 2017, then-Interior Secretary Ryan Zinke ordered a review of the sage grouse plans. Conservation groups say these final updated plans are disheartening. Killing Ravens to Save Sage Grouse? The Oregon Department of Fish and Wildlife (ODFW) has applied for federal permits to kill up to 500 ravens a year for three years in Baker County Sage Grouse habitat. Ravens are known to predate sage grouse nests (as are badgers, coyotes, and other species), but this proposal is not supported by on-the-ground research on the significance of this predation in Baker County. Moreover, state and federal agencies have failed to adequately address other causes of sage grouse declines, such as a large 4,918-acre off-road vehicle area that sits on public lands within the designated Sage Grouse Priority Area for Conservation. The proposed lethal control – putting out decoy eggs laced with poison – is inhumane. Poisoned ravens will die a slow death due to renal failure. Their young will be left to starve to death in their nests. 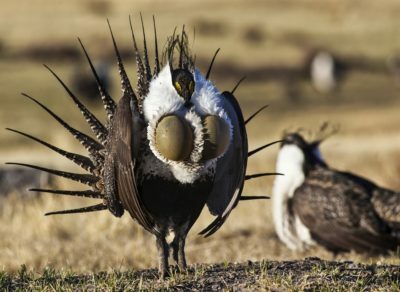 The proposal to kill ravens comes at a time when the Trump Administration is reducing critical protections for sage grouse across the West, including allowing increased grazing on some BLM lands in Oregon identified as Sage Grouse Priority Areas for Conservation. It is outrageous that the federal government would allow the killing of up to 1,500 ravens without strong supporting research, while at the same time decreasing strategies for protecting sage grouse that have overwhelming scientific support. For more information, visit: https://audubonportland.org/issues/take-action/help-stop-raven-killing-in-eastern-oregon. Finally, as promised, a bit of good news…. A federal judge ruled on April 19 that the Interior Department violated federal law by failing to take into account the climate impact of its oil and gas leasing in the West. The decision by U.S. District Judge Rudolph Contreras of Washington marks the first time the Trump administration has been held to account for the climate impact of its energy-dominance agenda, and it could signal trouble for the president’s plan to boost fossil fuel production across the country. Contreras concluded that Interior’s Bureau of Land Management “did not sufficiently consider climate change” when making decisions to auction off federal land in Wyoming to oil and gas drilling in 2015 and 2016. The judge temporarily blocked drilling on roughly 300,000 acres of land in the state. [Much of this land is sage grouse habitat]. Jeremy Nichols, who directs WildEarth Guardians’ climate and energy program, said in a phone interview that the decision would force the administration to reveal how its policies are helping to fuel climate change. He said his group would now take steps to try to block federal oil and gas lease auctions scheduled for next week, which encompass an additional 560,000 acres of western land.